Thanks to the newly-opened Shelley-Godwin Archive, you can read "for the first time in digital form all the known manuscripts of Frankenstein," Mary Shelley's finest work and arguably the most famous work of British Romanticism. When I placed my head on my pillow, I did not sleep, nor could I be said to think. My imagination, unbidden, possessed and guided me, gifting the successive images that arose in my mind with a vividness far beyond the usual bounds of reverie. I saw — with shut eyes, but acute mental vision, — I saw the pale student of unhallowed arts kneeling beside the thing he had put together. I saw the hideous phantasm of a man stretched out, and then, on the working of some powerful engine, show signs of life, and stir with an uneasy, half vital motion. 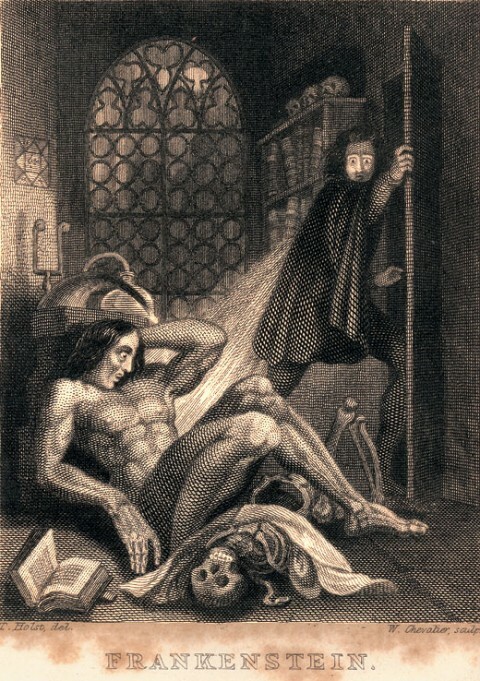 This became the kernel of Frankenstein; or, The Modern Prometheus, the novel first published in London in 1818, with only 500 copies put in circulation. In writing Frankenstein, Shelley used a series of notebooks that "can now be viewed in high quality, resizable page images." Each hand-written page comes accompanied by a typed transcript. Find them all here. Funded by The National Endowment for the Humanities and The Gladys Krieble Delmas Foundation, the new archive was assembled by the University of Maryland’s Institute for Technology in the Humanities, The New York Public Library, the Bodleian Library, The Huntington, and the Harvard University Library. 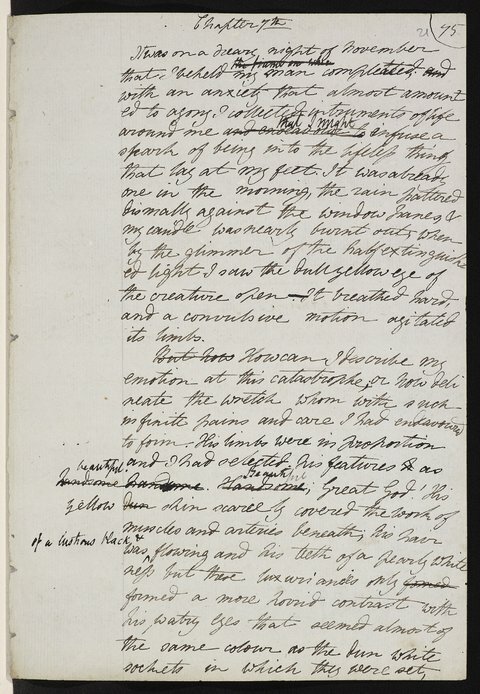 Down the line, the Shelley-Godwin Archive "will provide the digitized manuscripts of Percy Bysshe Shelley, Mary Wollstonecraft Shelley, William Godwin, and Mary Wollstonecraft, bringing together online for the first time ever the widely dispersed handwritten legacy of this uniquely gifted family of writers." So stay tuned for more. Note: The Archive recommends using recent versions of Google's Chrome browser or the latest version of Safari or Mozilla Firefox when viewing the manuscripts. this is just so inspirational to look at! It makes me want to pick up a pen and paper and write!